Landscape Lighting adds excitement and style to your home. Well designed landscape lighting also allows you to move around at night safely and comfortably brings guests to your front door. These lighting fixtures are primarily low voltage and come in many types and sizes giving the landscape or lighting designer a variety of ways to accent your house and plantings. Improve the night time street appeal of your house by adding impressive lighting that is designed to show off the fine points of your home and grounds. In this lovely photo by Peter Cox of Nebula Media, my client's house is shining. It is a great illustration of effective exterior lighting design done by my colleague, INARAY. The front door and steps are very visible. The door way is nicely lit by a ceiling fixture. When accenting the front of the house, balance is important. You want the light to softly flow along the entire structure without harsh bright light at one spot and a dark spot on the opposing side. This is where a good landscape lighting designer that knows fixtures and what they will do becomes a valuable asset. Landscape Lighting Plants Brings Distinction and Beauty to your Landscape! Trees offer an opportunity for accent lighting that can also help light a pathway or driveway. Lights mounted in large trees that cast light downward produce interesting shadows on the ground as well as a moon light haze that helps drivers and walkers see better. This style of lighting is referred to as "Moonlighting". Small specimen trees like Japanese maples can have light come up from the base of the trunk filling the canopy to show it off. Up lighting also shows off the trunk which is especially effective in winter. Also, It is dramatic and impressive to look out a back window and see a favorite tree lit or shadows cast from above down onto your lawn. Think about how nice it would be to extend your time spent outside because of the addition of effective lighting. An important design detail is to keep the source of the light invisible. You want to see the soft light flowing over a path, not a line of fixtures that disturb the integrity of your well designed landscape. Fixtures can be nestled among shrubbery to hide them. There are decorative path lights that cast the light downward instead of having glass sides that expose the bulb. Fixtures come in a range of qualities. Use at least a mid grade fixture because it lasts longer and operates better than lower grade fixtures. Most likely, this fixture is made of cast aluminum instead of plastic, for example. If there is a reason to show case the fixture, they are available in brass and bronze some with beautiful patinas as well. Usually, I like to use a fixture that is a verde green or bronze color, so that it blends into the landscape and fades away. Low voltage landscape fixtures are wired to a transformer that is simply plugged into an outlet. Transformers can be installed under the house, in an outdoor utility area, or on the side of the house behind an evergreen shrub for just a few suggestions. The transformer converts 110 volt household current to 12 volts. The fixtures are wired to the transformer. The lighting designer specifies the correct transformers for the type and number of fixtures for your project. The distance the fixture is located from the transformer is also an important detail to consider when sizing the transformer. The landscape lighting industry uses low voltage fixtures because they are incredibly safe and produce a soft, low light. A 12 volt fixture that may be torn out of a tree during a storm is no safety risk for the home owner. This would not be true of a 110 volt fixture. Keep in mind that soft low voltage light can be washed out by 110 volt security lighting. If you have security lights mounted on the corners of your house, have separate switches for the low voltage lights. This way you can operate them separately. Lights in step risers light the step treads, so you can safely navigate the steps. Slim, invisible low voltage fixtures can neatly tuck under a wall cap lighting the wall below while helping you see your way. 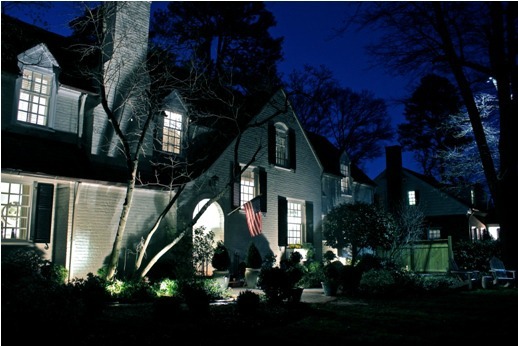 Low voltage landscape lighting can add a level of sophistication and beauty to your property as well as safety. Be sure to design it right for a system that performs at its peak and adds distinction. Landscape Lighting a problem? Ask the Expert! I's enjoy hearing from you and helping. I'll get back to you as quickly as possible usually within 24 hours. Turn your knowledge into a website that generates income for you. SBI (Solo Build It) is a powerful website creation and hosting system that shows you how it is done step by step. Take a look!